A truly inspirational evening, the only of its kind anywhere in the UK, the Leicester-Shire & Rutland Sport (LRS) Oldest Athlete Celebration Event was held on UK Older Persons Day October 1st 2012 to celebrate the achievements of senior sports people, volunteers and physical activity participants from across Leicestershire, Leicester & Rutland. Over 2,400 years of physical activity and sporting participation, collated from 33 nominated active older people from across Leicestershire, Leicester and Rutland were honoured. Local Go Gold athletes and volunteers involved with London 2012 were also present, sharing their experiences, motivations and ambitions with over one hundred guests in the audience, by responding to questions posed to them by children from Woodbrook Vale School and Hastings High School (members of the London 2012 Get Set network). This intergenerational element complimented perfectly the Oldest Athlete Celebration Event. The event is proud to be supporting the 2012 legacy ambitions of Inspire LeicesterShire. Also in attendance was Nicola White, GB Hockey Player & London 2012 Bronze Medalist, who presented the ‘2012 Legacy Ambassador Award’ to Tommy Godwin’s son-in-law. This event, a celebration of our most senior, physically active local community members was a most humbling experience, where it was impossible not to be touched by the shared experiences, including Brian Ashwell, aged 80, living the Mo Farah dream as 5k champion for his age group at the 2012 British Track and Field Championships. The most dedicated volunteer, Harry Matty (age 74) is bringing the 2012 legacy to life and inspiring tennis players of all ages and abilities through his commitment at Desford Lawn Tennis Club. Ray Capewell (73) continues to make an outstanding contribution to the sport of volleyball and was integral to the volleyball events at the 2012 Games. The star of the show and crowned as the ‘Oldest Athlete’, Nancy Kelly from Melton is truly inspirational swimming twice a week aged 92! Volunteer Award – Harry Matty, 74 years young, from Hinckley. Harry is a fantastic role model; he gives freely of his time to support players of all ages at Desford Lawn Tennis Club during coaching, matches and informal club sessions, volunteering for nearly 20 hours a week, come rain or shine. Brian has been part of the local athletics scene since the 1950s, and even though in July at the British Track and Field Championships he won the over 80s 5000m in a new Championship Record”. On the evening he said wasn’t that pleased with his performance! Dave was originally introduced to exercise in November 2011 when he was referred by his doctor to the Active Together scheme. Dave now spends at least an hour a week in the gym, plays bowls and dances weekly. Rowland started coaching in 1964; qualified as a coach in 1974 and an advanced coach in 1976. Rowland currently runs two breakfast clubs and two after school clubs which compete in the Leicestershire School’s League. Nancy is a regular swimmer at Waterfield Leisure Centre every Wednesday and Friday morning, often walking to the Centre and is the oldest member. Nancy is a shining example of fitness and healthy lifestyle. Neville has run over 25 marathons raising money for various charities along the way. Neville works tirelessly to raise money for a school in Ghana which is named after him – The Neville Preparatory School. On October 14th, Neville will be taking part in his 26th marathon in Germany! 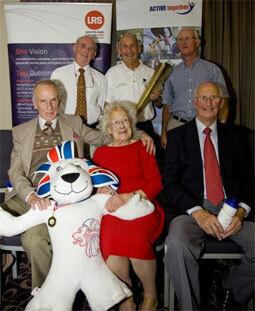 2012 Legacy Ambassador Award –Tommy Godwin, 91 years young from Solihull. Tommy competed in the 1948 London Olympic Games and won two bronze medals. He has provided outstanding support to Inspire LeicesterShire and the Flames Lighting the Way project.